Wow, it feels like forever since I've been able to participate in the Weekend Writing Warriors & Snippet Sunday blog hops. I took a look at the last post I did and decided to skip over a few lines of dialogue and directly into a more active set of sentences. Thanks for stopping by! Be sure to check out the talented writers who've joined me on today's blog-hopping adventures. They turned towards the barn in time to see a medium sized black and white dog rush through the snow, running with its belly low to the ground, its movement predatory. The animal’s intense focus never wavered from the men. Sebastian stepped back, placing Oliver between himself and the dog. The animal skidded to a halt a few feet from Oliver and snarled. It crouched in front of the men, holding its head lower than its shoulders and angled to glare up at them. Tension and energy radiated from the taught muscles. The animal’s eyes, one ice blue, the other gold, bounced from his face to his hand. And, because she's just too darn cute not to share, this little girl entered the world last night! Excellent description of the dog. Realistic and vivid! I wouldn't want to be them right now! Vicious. Wow, great writing. I can feel the intensity of the moment. ooo, yeah very suspenseful! I've been snarled at like that a couple times in my life and it really gets your blood racing. I once got chased down the block by a little white poodle who snarled and snapped at me the whole way! She sounded like a monster, lol! Now I'm really curious what the guys are going to do. Great tension here. And also not very nice of Sebastian, using Oliver to shield himself! I love the description of the dog, and terrific tension build. Well done! A dog with blue and gold eyes? Now that's different, but in a good way. Love the tension-building in this snippet! Welcome back! I could really see that dog from your description, got my adrenalin going. Makes me ponder as well, why Sebastian stepped back, why the dog has mismatched (but gorgeous) eyes...excellent excerpt! You've given us a good idea of Sebastian, from one action--very nice (the writing, not Sebastian :))! The dog's eyes are an interesting touch, too. Wonder if they're otherwise significant? Awww, what a lovely filly. Great tension and I agree with everyone that you've given us a very good sense of Sebastian's personality and a hint at the dynamic between these men. Border Collie! (Or a predecessor of one.) And the odd eyes are unusual in a non-merle but not unknown, especially if the dog has a half-white face. Great snippet, full of tension and wonderful descriptions! Hey Jess--that's a great description of the dog on the defense! Wonderful. Awesome dog description, I like its eyes. Heterochromia rocks! Yes, it has been a while since you played along. Good description of the dog's ferocity. 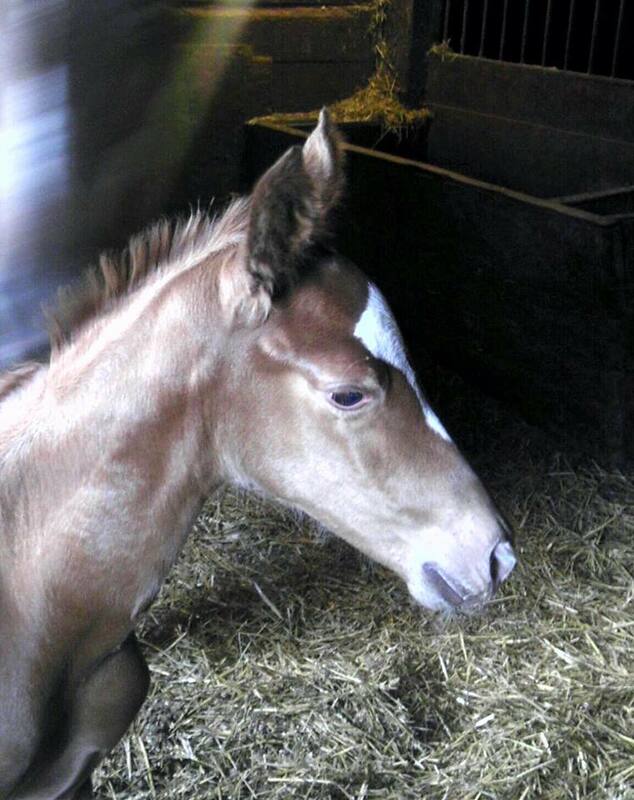 Great description and a lovely foal there. At one point this evening I thought I would have a hinny climb on my knee (at least he weighs a lot less than the cob that thinks if I'm sitting down he can get my attention with a hoof on my thigh). Adorable foal! And excellent description -- very vivid.